"Thankyou for delivering on time while taking the orders on the same day!!" "Nice.. Good job team. Keep it up." "The whole process of ordering is very easy and it is good value for price but would like the quality of product shown be equivalent in all cities"
"It made my parents day to receive the flowers even when i am not there to give it to them personally!" 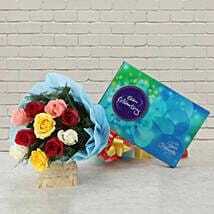 "The person I spoke to on phone when putting my order was very help full and polite"
Flowers and chocolates to Anniversary at low cost from our online shopping website and express your love and care for one another. 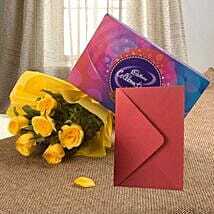 Flowers and chocolates immensely reflect your legitimate love towards your special one. 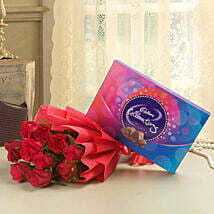 Chocolates and flowers will add romance to your relationship. 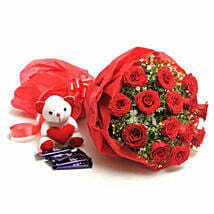 Symbolizing love and passion, send colourful flowers and tasty chocolates to your wife, husband, boyfriend, girlfriend etc. By sending flowers and chocolates you pull back from your daily busy and normal life and relive a moment that changed your life forever. 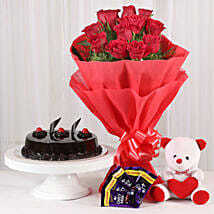 Show another person how much you love or care for them and Send cakes online from our online shopping website. We offer a wide variety of flavours such as chocolate, pineapple, black forest, honey etc. Send Flowers and chocolates to Anniversary online to your loved ones because it is the best way to express your feelings and emotions towards them on this special day. All the cakes, flower etc will be hand delivered to your loved ones. We also offer Mid night delivery cakes. Surprise your beloved with a delicious cake at 12am and make this day more special and memorable. 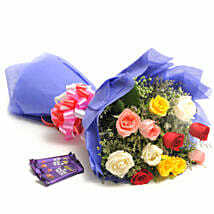 Express your inner feelings and true love by sending amazing bouquet of flowers and delicious chocolates to your beloved. Delivery services of our online shopping website are always on time & product is 100% damage free.